OBJECTIVE: To assess and compare the changes in pharyngeal airway space dimensions following orthodontic treatment of skeletal class II and class III facial deformities with premolar extraction. MATERIALS AND METHODS: Sixty pre and posttreatment lateral cephalometric radiographs of patients who underwent fixed orthodontic treatment with premolar extraction were collected. The sample was divided into two groups – 32 patients with skeletal class II and 28 patients with skeletal class III malocclusion. Both groups were subdivided into growing patients (<16 years old) and adults (>16 years old). Nasopharyngeal, palatopharyngeal, and glossopharyngeal airway space dimensions were measured in the pretreatment (T0) and posttreatment (T1) cephalometric radiographs using Dolphin Imaging 11.7 software. Two-way, repeated-measures analysis of variance was used to assess the in-treatment changes. RESULTS: Nasopharyngeal airway dimension showed similar significant increase in class II (P = 0.042) and class III (P = 0.049) patients from T0 to T1, whereas palatopharyngeal and glossopharyngeal dimensions were insignificantly decreased in both groups. However, both malocclusions followed the same pattern of changes in relation to airway dimensions. In addition, no significant statistical difference was found in the airway spaces between growing and adult patients. 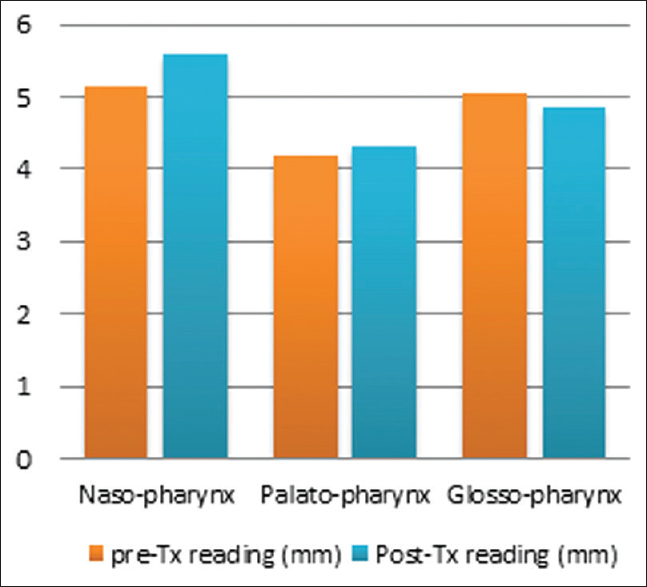 CONCLUSIONS: Extraction of premolars did not affect the pharyngeal dimensions except those of the nasopharynx, which showed a significant increase after extraction in both groups. Analysis of the pharyngeal airway space has been of interest for orthodontists, oral surgeons, and ENT specialists with respect to their treatment modalities. Orthodontic camouflage treatment in class I bimaxillary protrusion and class II and class III malocclusion, with two or four premolars extraction, may encroach on the tongue space due to a reduction in the arch length. Its effects on the dimensions of the pharyngeal airway are unknown. Likewise, the significant relationship between pharyngeal, dentofacial, and craniofacial structures explains the concern of many previous studies,, with regards to airway dimensional changes. The airway space has three levels in relation to their adjacent structures – the nasopharynx, palatepharynx, and glossopharynx. Previously conducted studies revealed that the important determinants of airway morphology include the size of the tongue, soft palate, and pharyngeal fat pads, as well as the positions of the lateral pharyngeal wall, maxilla, and mandible. Moreover, different facial deformities reflect discrepancies in the size, form, and position of the upper or lower jaw and the surrounding soft tissues on pharyngeal airway morphology. Zhong  and Solow et al. concluded that airway adequacy is related to the position and size of the mandible rather than maxillary variables. However, Wenzel et al. found no association between airway size and morphology of the mandible, even though they reported change in maxillary protrusion and nasopharyngeal airway dimensions. Over the years, multiple imaging modalities, including cephalograms, fluoroscopy, fiber-optic pharyngoscopy, computed tomography, and magnetic resonance, have been introduced and used to evaluate airway space. Although advanced techniques are widely spreading, they are expensive and not readily available for dental use. Cephalometric analysis is a reliable and most common tool for the assessment of dental and skeletal anomalies,, and most of the studies reviewed used cephalometric analysis to assess airway dimensional changes. Because the retraction of the incisors after premolar extraction alters not only soft tissues, including the tongue pharyngeal airway space, further investigation is necessary to evaluate the effect of such treatment and its consequent influences on airway space dimensions. The purpose of this retrospective study was to evaluate and assess the dimensional changes that may occur in the pharyngeal airway space due to premolars extraction as a part of orthodontic treatment in patients with skeletal class II and class III malocclusion. The study was conducted in the Orthodontic Department of the College of Dentistry in King Saud University from September 2015 to April 2016. The College of Dentistry Research Center at King Saud University approved this study #IR 0142. Pretreatment (T0) and posttreatment (T1) lateral cephalometric radiographs from 60 patients reporting to the orthodontic department were collected. All patients underwent orthodontic treatment with premolars extraction and fixed orthodontic appliances. Availability of pre and posttreatment lateral cephalograms with clear anatomical structures of interest. The sample was divided into two main groups: Class II (males = 10, females = 22) and Class III (males = 12, females = 16), as shown in [Table 1]. 1b: Adults ≥16 years old (13 patient). 2b: Adults ≥16 years old (12 patients). All pre and posttreatment lateral cephalometric radiographs were exposed to the same equipment with a standardized technique (patients in natural head position and teeth in centric occlusion). All measurements concerning the classification of malocclusion were analyzed using two methods: manually using a pencil and acetate tracing sheet and digitally using Dolphin Imaging 11.7 software (Chatsworth, CA, USA), registered by the College of Dentistry, King Saud University. The cephalograms were digitized using a scanner and a transparency adaptor (Epson Perfection 4990 photo) at 300 dpi resolution and saved in an image format. Scanning was performed in the presence of the specific ruler of the Dolphin Imaging 11.7 software [Figure 1] to overcome the magnification of the radiographs. [Figure 2] illustrates the landmarks and linear measurements used in our study based on the analysis by McNamara  and Lowe et al. Respiratory tract problems were identified by reviewing patients' medical records and then double checked by digital analysis using the McNamara linear method, which was based on the upper pharyngeal width, measured from the dorsum of the soft palate to the closest point on the posterior pharyngeal wall. Patients with airway obstruction/impairment were excluded if the upper pharyngeal width was ≤5 mm in width. All data were entered in the Microsoft Excel (Microsoft 2011, Redmond, WA, USA) and analyzed using SPSS v. 22.0 (SPSS Inc., Chicago, IL, USA). Measurement errors between the two investigators were first assessed. Ten lateral cephalometric radiographs from five individuals were randomly selected to test for inter-examiner and intra-examiner reliability, which was re-analyzed after a 1-month interval. The mean differences were less than 1.0 mm and 1.0° for linear and angular measurements, respectively, and the reliability between both examiners was very high (0.95). Cephalometric analysis of the pharyngeal airway space, including the nasopharynx, palatopharynx, and glossopharynx, were obtained from pre and posttreatment radiographs, as shown in [Figure 2]. Subsequently, statistical analysis using two-way, repeated-measures analysis of variance (ANOVA) was conducted. A significance level of 5% was used; P< 0.05 was considered to represent a statistically significant relationship. 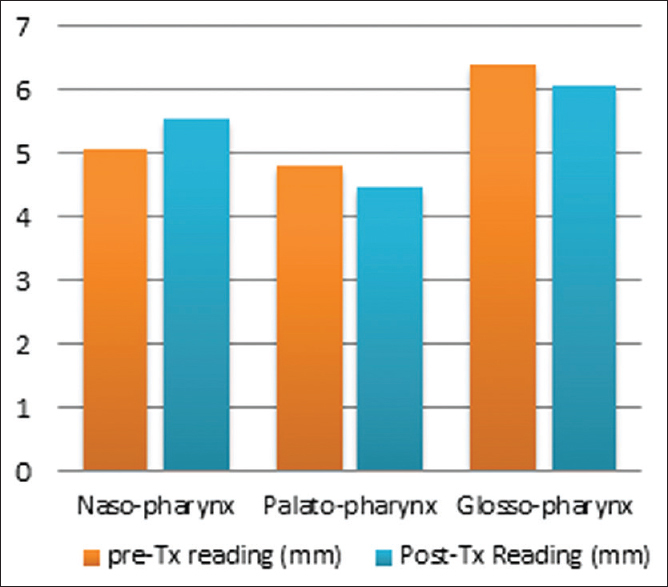 Statistical analysis revealed that skeletal class II patients showed a significant dimensional increase (P< 0.05) in nasopharyngeal cephalometric measurements between pretreatment and posttreatment (T0–T1), whereas no significant difference was found in the palatopharynx and glossopharynx in the same group, as shown in [Table 2] and [Figure 3]. On the other hand, a statistically significant increase (P< 0.05) was observed in the nasopharyngeal airway dimension in the skeletal class III group. However, at the palatopharyngeal level, there was a weak significant decrease (0.05 < P< 0.10) between pretreatment and posttreatment readings. In contrast, the glossopharyngeal dimension showed an insignificant statistical difference, as illustrated in [Table 3] and [Figure 4]. As shown in the analysis, skeletal class II and class III patients exhibited the same pattern of changes in nasopharyngeal and glossopharyngeal measurements. Dissimilarities were observed between the two groups in the palatopharyngeal dimension. It was insignificantly increased in class II patients and decreased with weak significance in class III patients [Table 4]. Because growth differences play an important rule, further investigation was carried out to exclude growth as a factor by dividing the sample into growing and adult groups. Surprisingly, a statistically significant difference was not observed between both groups in relation to growth. In addition, differences in all airway space measurements were found to be statistically insignificant [Table 5] and [Table 6]. Consequently, both groups were pooled together and classified into class II and class III patients. The goals of orthodontic treatment are to correct malocclusions and improve the dentofacial relationship, which may require the removal of premolars. Several authors such as Solow et al. have reported an intimate relationship between airway adequacy and different craniofacial morphologies. Others consider incisor retraction to be an important factor that may lead to the narrowing of the airway. 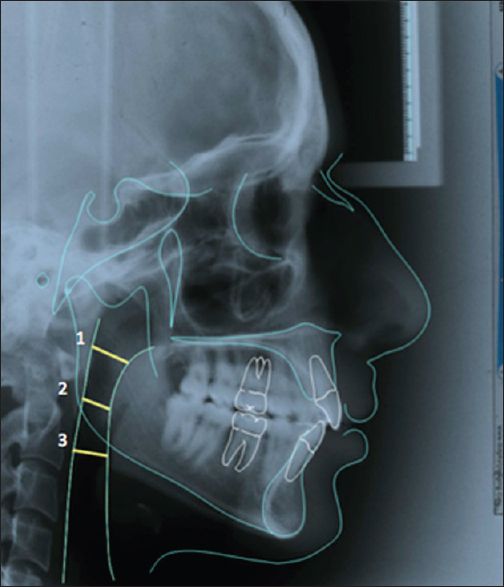 The main aim of this retrospective analytical study was to assess and compare the pattern of the changes in the upper, middle, and lower pharyngeal airway dimensions before and after orthodontic treatment with the extraction of premolars in skeletal class II and class III malocclusions. These measurements were obtained from cephalometric radiographs while patients were seated in natural head position. Moreover, previous studies emphasized that the pharyngeal airway dimensions are influenced by growth., Studies reported that individuals aged 6–9 and 12–15 years showed higher rate of changes in soft tissue measurements of the pharynx. An increase in adenoid thickness leads to a decrease in the nasopharyngeal airway space, becoming narrow at age 5; then, the adenoid tissue enlarges again at 11 years of age. Consequently, the sample group of the current study was divided into growing and adult subgroups. Unpredictably, data analysis revealed no statistically significant difference between the two subgroups with regards to the pharyngeal airway dimensions. This result, together with the literature findings, indicates that growth may have little, if any, effect on the dimensional changes of the pharyngeal airway. As a result, the subgroups were pooled together to form groups of class II and class III patients, and the pharyngeal dimensions were measured on lateral cephalometric radiographs using the Dolphin imaging system. The present study showed an increase in the nasopharyngeal airway space after orthodontic treatment in all skeletal class II and class III patients with premolar extraction. This increase in posttreatment measurements suggests that the extraction may have a positive effect on the airway space, which is of great importance in patients with respiratory problems. This finding was in agreement with Stefanovic et al., who found that, although the dental arch perimeter decreased significantly as a result of premolars extraction, this reduction did not negatively influence the dimensions of the pharyngeal airway. Chen et al. found that incisor retraction may cause narrowing of the upper airway dimension, however, his sample included adult patients having bimaxillary protrusion. However, the palatopharyngeal and glossopharyngeal dimensions in our study revealed a generalized decrease in all patients from both groups. This reduction could be explained because of tongue retraction caused by the narrowing of the tongue space after orthodontic treatment with extraction. This finding was in agreement with Germec-Cakan et al., who reported a decrease in the middle and inferior airway spaces. However, Valiathan et al. concluded that, after orthodontic treatment with premolar extraction, there were no statistically significant changes in pharyngeal airway volume. Consequently, airway analysis should be taken into consideration when planning orthodontic therapy. The upper airway is important in respiration, swallowing, and phonation, and this study identified the reduction of the palatopharyngeal and glossopharyngeal airway spaces after orthodontic treatment. Further investigations should employ three-dimensional imaging modalities and a larger sample size, which will increase the power of the statistical analysis. A significant increase in the nasopharynx was observed in class II and III patients after orthodontic treatment with premolar extraction. The changes in the airway dimensions of the palatopharynx and glossopharynx were insignificant in both classes after the extractions. Growth had no significant effect on the dimensional changes of the pharyngeal airway in our study sample. Kapoor S, Pallav P, Moirangthem R, Varshney SR, Jain AK. Upper and lower pharyngeal airways in skeletal Class-I and Class-II malocclusions with different craniofacial patterns. Ann Dent Specialty 2014;2:85-90. Wang Q, Jia P, Anderson NK, Wang L, Lin J. Changes of pharyngeal airway size and hyoid bone position following orthodontic treatment of Class I bimaxillary protrusion. Angle Orthod 2012;82:115-21. 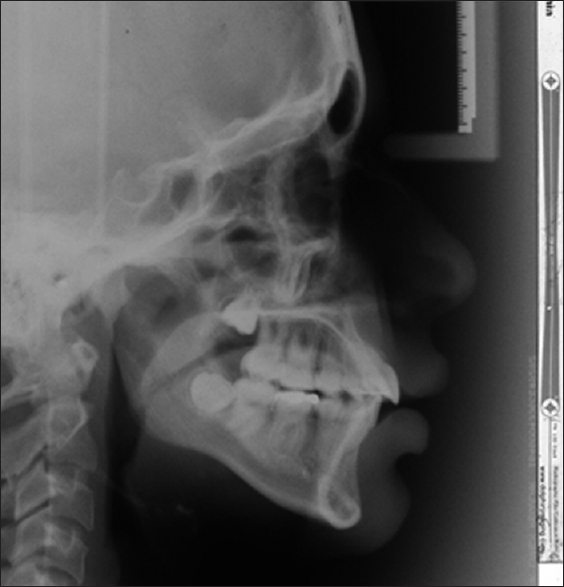 Cakarne D, Urtane I, Skagers A. Pharyngeal airway sagittal dimension in patients with class III skeletal dentofacial deformity before and after bimaxillary surgery. Stomatologija 2003;5:13-6. Chen Y, Hong L, Wang C, Zhang S, Cao C, Wei F, et al. Effect of large incisor retraction on upper airway morphology in adult bimaxillary protrusion patients: Three-dimensional multislice computed tomography registration evaluation. Angle Orthod 2012;82:964-70. Zhong Z, Tang Z, Go X, Gao X, Zeng XL. A comparison study of upper airway among different skeletal craniofacial patterns in nonsnoring chinese children. Angle Orthod 2010;80:267-74. Solow B, Siersbæk-Nielsen S, Greve E. Airway adequacy, head posture, and craniofacial morphology. Am J Orthod 1984;86:214-23. Wenzel A, Williams S, Ritzau M. Relationships of changes in craniofacial morphology, head posture, and nasopharyngeal airway size following mandibular osteotomy. Am J Orthod Dentofacial Orthop 1989;96:138-43. Guttal KS, Burde KN. Cephalometric evaluation of upper airway in healthy adult population: A preliminary study. J Oral Maxillofac Radiol 2013;1:55-60. Al Maaitah E, El Said N, Abu Alhaija ES. First premolar extraction effects on upper airway dimension in bimaxillary proclination patients. Angle Orthod 2012;82:853-9. McNamara JA. A method of cephalometric evaluation. Am J Orthod 1984;86:449-69. Lowe AA, Ono T, Ferguson KA, Pae EK, Ryan CF, Fleetham JA. Cephalometric comparisons of craniofacial and upper airway structure by skeletal subtype and gender in patients with obstructive sleep apnea. Am J Orthod Dentofacial Orthop 1996;110:653-64. Kaur R, Gandikota C, Mody DR, Poornima KY, Juvvadi SR. An insight into relationship of hypertrophied adenoids and tonsils and dentofacial form. IOSR J Dent Med Sci 2014;13:48-54. Proffit W, Fields H, Sarver D. Contemporary Orthodontics. 5th ed. USA: CV Mosby; 2013 ISBN: 9780323083171. Valiathan M, El H, Hans MG, Palomo MJ. Effects of extraction versus non-extraction treatment on oropharyngeal airway volume. Angle Orthod 2010;80:1068-74. Germec-Cakan D, Taner T, Akan S. Uvulo-glossopharyngeal dimensions in non-extraction, extraction with minimum anchorage, and extraction with maximum anchorage. Eur J Orthod 2011;33:515-20. Stefanovic N, El H, Chenin DL, Glisic B, Palomo JM. Three-dimensional pharyngeal airway changes in orthodontic patients treated with and without extractions. Orthod Craniofacial Res 2013;16:87-96.